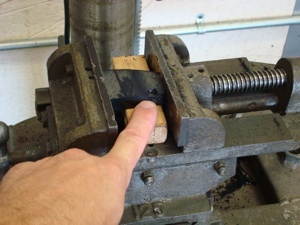 We will make a new convertible top guide to demonstrate the procedure for making a new striker plate, stop or guide. 1. Here is the guide we want to reproduce. 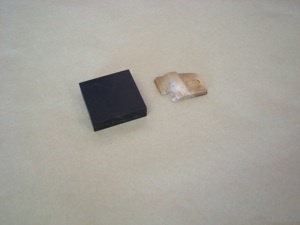 The material becomes brittle and over the years, causing it to crack and chip. 2. 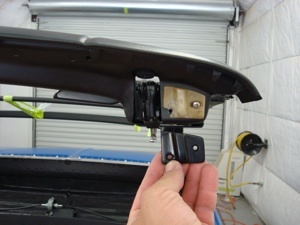 We are using a very durable plastic with natural lubricating properties and you can buy it at most plastic supply houses. It comes in black or milky white colors. 3. 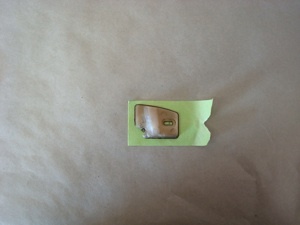 We start with a piece slightly larger then the original. 4. 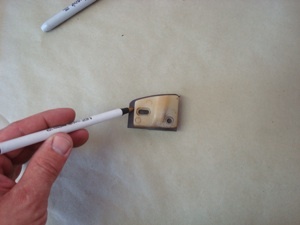 Here we use the original as a template to mark the outside edges. 5. 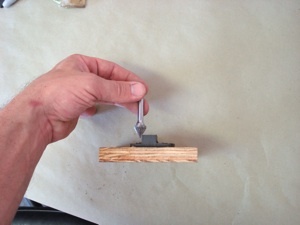 Then we cut it out on a band saw, leaving an 1/8th inch margin for clamping. 6. Here is what we have so far. 7. 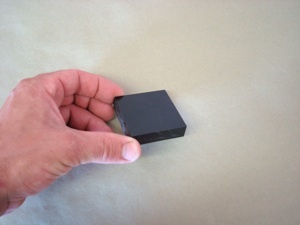 The new material is slightly thicker than the original but that will not be a problem. 8. 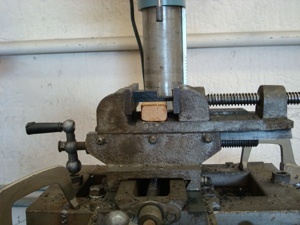 Next we install the new piece in a three-way vise with a block of wood underneath for support. 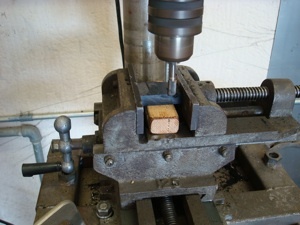 We will use a simple carbide burr in the drill press. 9. 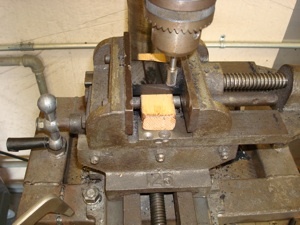 Then we gradually create the desired shape by moving the vise. 10. 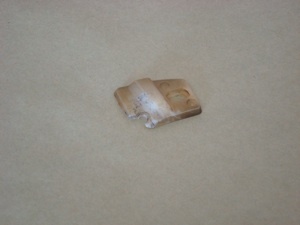 Here you can see what happens (the chip) if you move too fast. 11. So we make nice, slow and steady passes. 12. 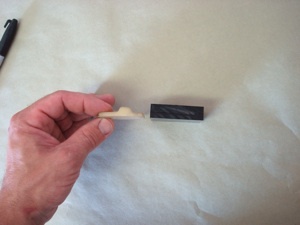 Now you can see that one side is cut to the right depth. 13. And here we have cut down both sides. 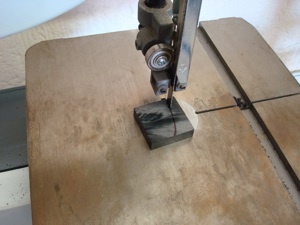 We will remove the wings at the ends with a belt sander before continuing. 14. 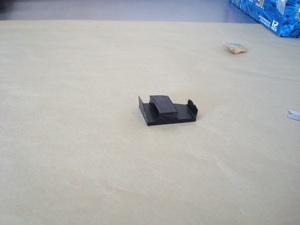 In this picture you can see that we used a piece of tape to create a template for the holes. 15. 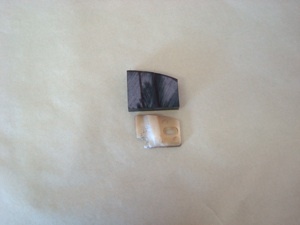 Then we transferred the outside edges of the original piece to our new piece. 16. 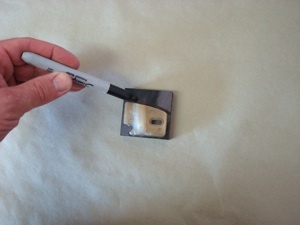 Next we carefully handle the tape without using our hands to prevent a loss of stickem. 17. 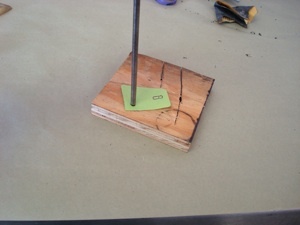 And place it on the new piece so we can drill the holes in the correct location. 18. 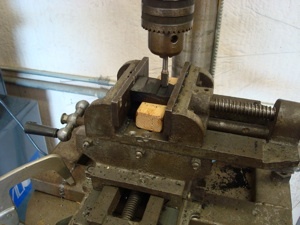 Now we can use a hole to screw the piece onto a block of wood for the final steps. 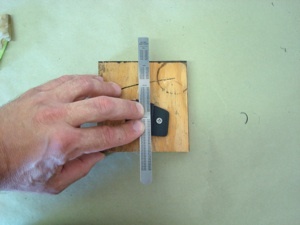 We are using a straight edge here to accurately measure for final tweaking. 19. 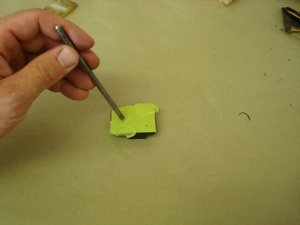 Here we are picking out a beveled bit to apply a slope to the guide. 20. 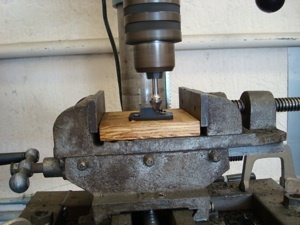 Now back to the drill press to cut the slope. This is also a good time to go back to the straight bit and trim the perimeter to the actual size. 21. 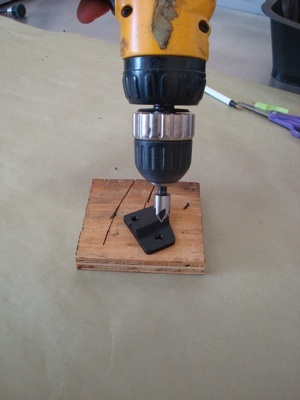 Finally, we alternate the hold-down screw so we can carefully countersink the holes. 22. 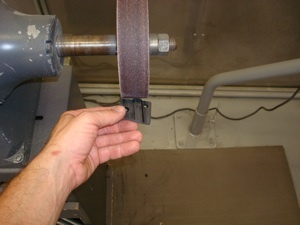 And then a quick pace on the belt sander to remove the burrs. 23. 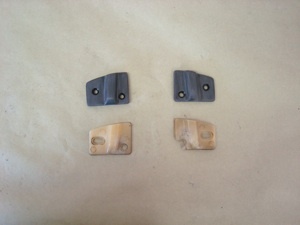 Here you can see how well the new guides matches the original ones. 24. And here you can see how they will look on the application.